It all starts before twelve, just before most Londoners will show up, sluggish from too many drinks the night before and seeing the early hours of the day, and crowd the narrow ropewalk. My perfect trip to the market starts when it’s still relatively quiet, so I can grab a thin, somewhat fragile jamon sandwich from the Tozino stall, a gentle reminder that the simplest food can be the most perfect, the bread crusty but soft and chewy; salty, marbled slices of jamon iberico, so thin they’re translucent, and a fresh, bright tomato puree. 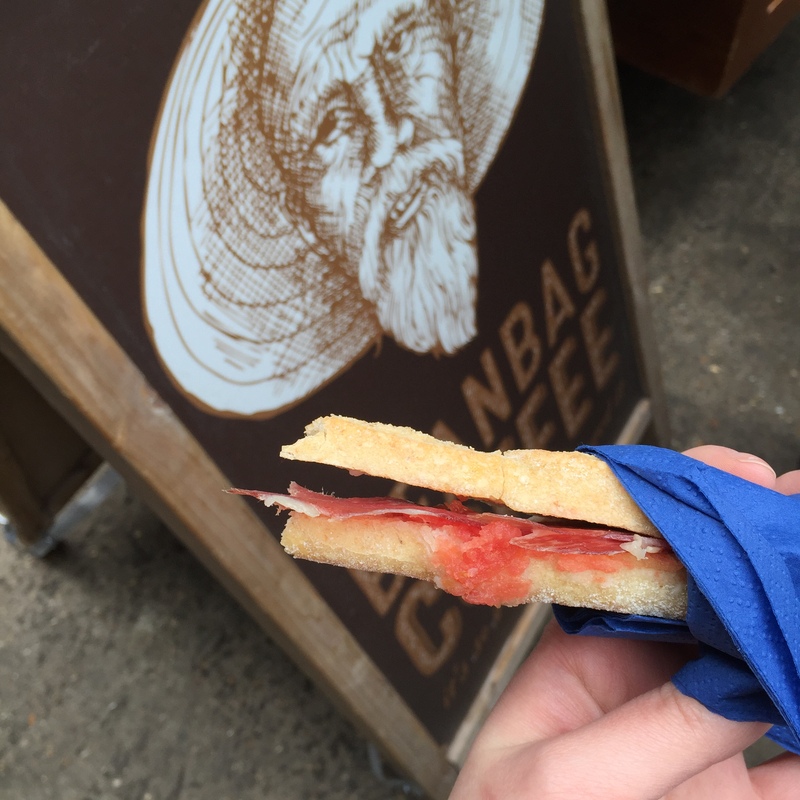 I could choose to sit inside, a sultry Spanish bar, and pick at plump green olives while sipping on sweet, thick sherry, but when it’s too nice a day to that, I eat the small sandwich standing. 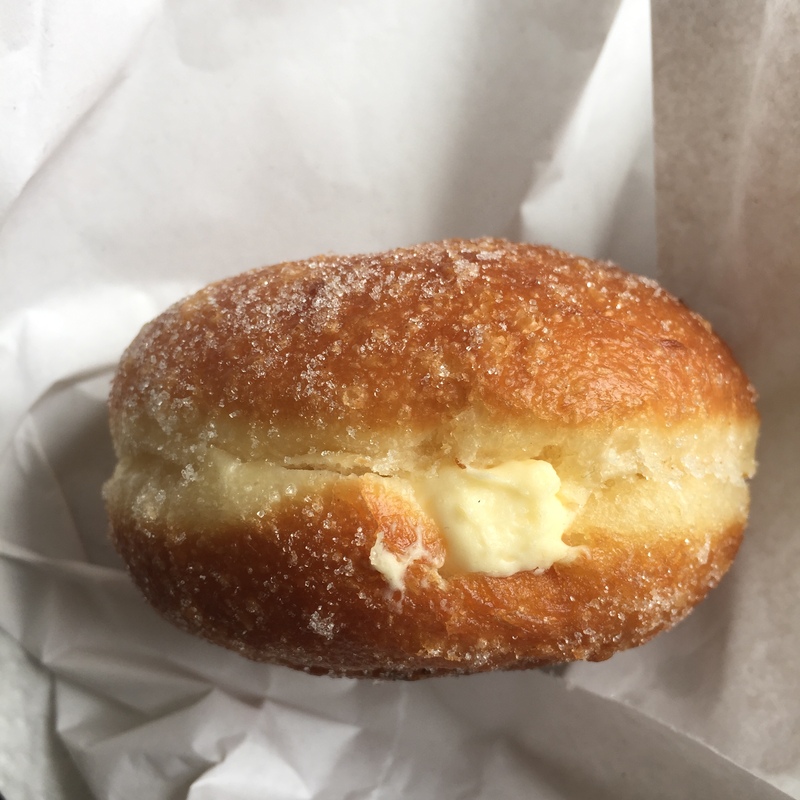 I also get some jamon for later, and on that note, I pop into St John’s to buy a perfectly round sourdough loaf, and of course a a couple of doughnuts, the vanilla-speckled custard almost spilling out. At this point, my mood normally decides the next stop: it could be a Stilton, Pear and Bacon Toastie, impossibly rich and decadent, sharp with blue cheese and sweet with pear chutney; I could have hearty tartiflette, cheese oozing on soft potatoes, especially on a cold day. 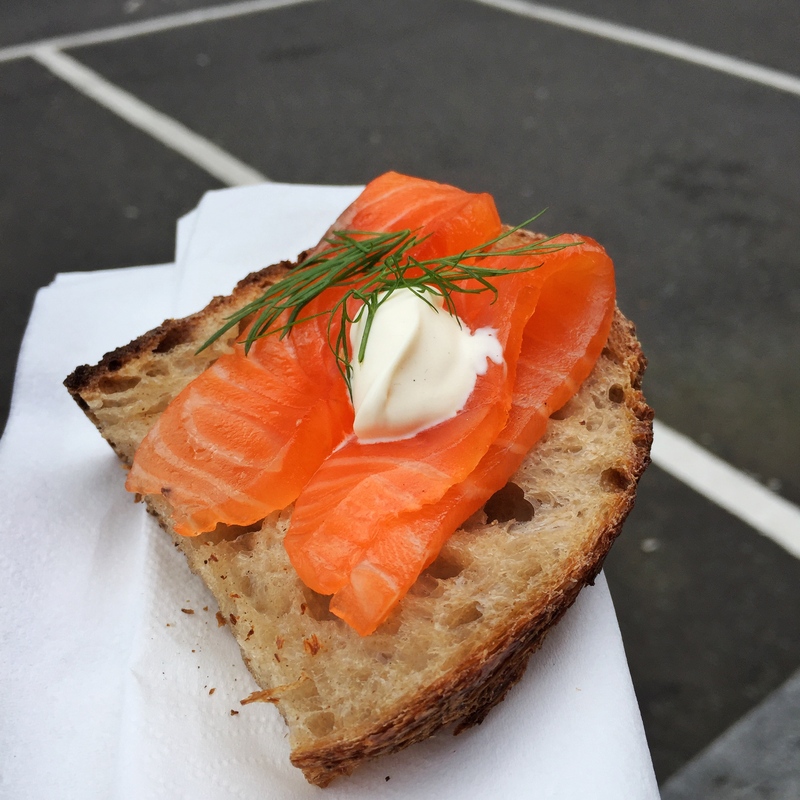 Today, a warmer day, Hansen&Lydersen‘s jewel-hued smoked salmon on sourdough somehow hits the spot, again as uncomplicated as a Saturday afternoon. The small tamales stall also offers the most plain-looking, comforting little rectangles of warming corn husk and bright tomatillo chicken, spicy enough to keep things interesting. It’s now past 1 o’ clock and I can just about squeeze through the crowd, and that’s how I know it’s time to grab a coconut coffee from the Asian coffee place, handcrafted, which I’m not entirely sure what it means as I normally tend to steer clear of coffee – but the deep richness of their take on it, spiked with coconut milk, creamy, sweet and somehow exotically scented makes it the perfect companion for a rainy day. It’s a short walk to Druid Street market, much smaller and quieter. There’s a stall selling Japanese knives with a man proudly telling stories from his trips to Osaka. A girl is arranging painfully beautiful pottery, hand thrown bowls and mugs painted in muted hues of blue and grey. 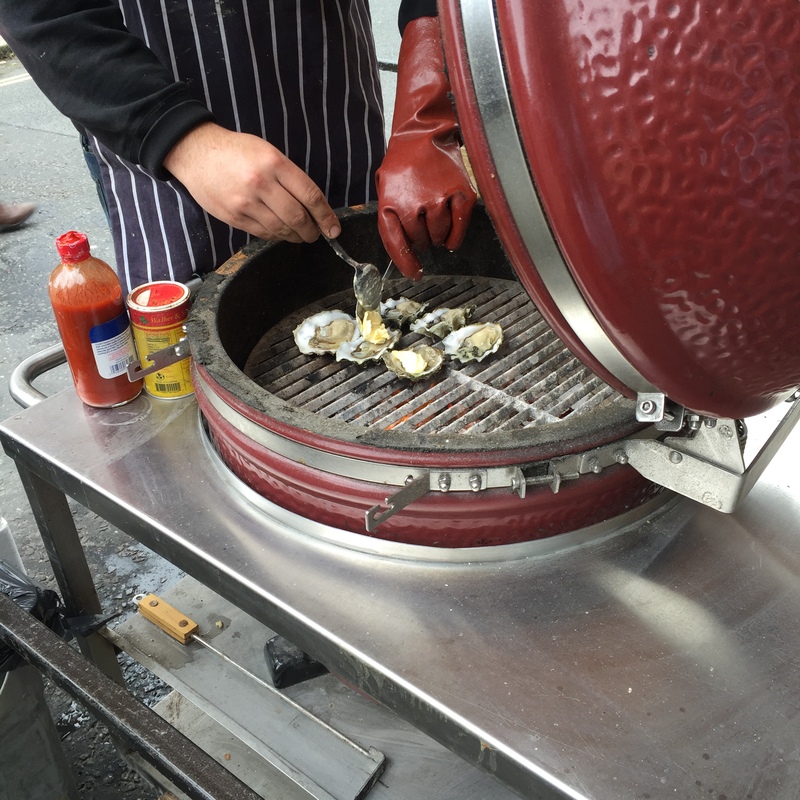 A bearded man is char grilling oysters when someone from New Orleans approaches him to tell him of how he knows the family that invented the round barbecue he’s using. They discuss grilling techniques as he shucks the Oysters, with their marbled, knobbly shells. 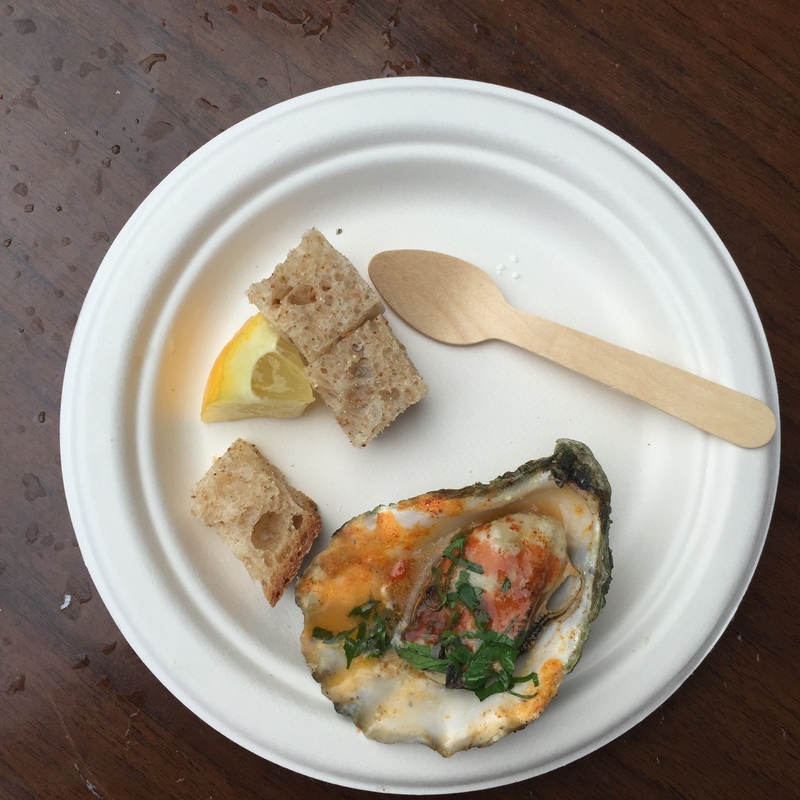 My favourite way to have them is still raw, their mineral taste reminiscent of sea water, childishly pretending to be at the seaside, but I’m in awe of the way he competently places them on the fire, a generous slab of butter on them, a spice rub, some bright red hot sauce. A squeeze of lemon and it’s time to go home.